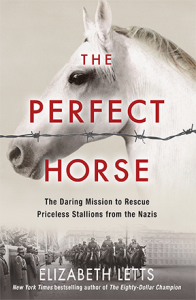 In the chaotic last days of World War II, a small troop of battle-weary American soldiers discover a sinister Nazi plan: there is a secret farm nearby where the German army has stockpiled the world’s finest purebred horses in order to breed an equine ‘master race’. With the Russian army closing in, the animals are in danger of being slaughtered for food. Colonel Hank Reed, one of the US Army’s last great cavalrymen, makes abold decision (with the unofficial approval of General George Patton) to mount a covert rescue operation. Racing against time, Reed and his men, aided by several Germans devoted to the horses, steal across enemy lines in a last-ditch effort to rescue the animals. The Perfect Horse for the first time tells the full story of these extraordinary events. Elizabeth Letts’s exhilarating tale of behind enemy-lines adventure, courage and sacrifice brings to life one of the most inspiring chapters in the annals of human valour.